The Clean Ireland Recycling PAY BY WEIGHT SERVICE helps both the environment and your pocket. It is the tried and tested most cost-efficient way for Irish householders to manage their domestic waste. The more material you can divert to your Blue Top recycling bin and your brown food waste bin, the less you pay. Your EASYPAY Card will facilitate your account at any PostPoint or Post Office* location. Pay with Credit/Debit Card on our 24 hour automated service — call 1890 361800 and select option 2. 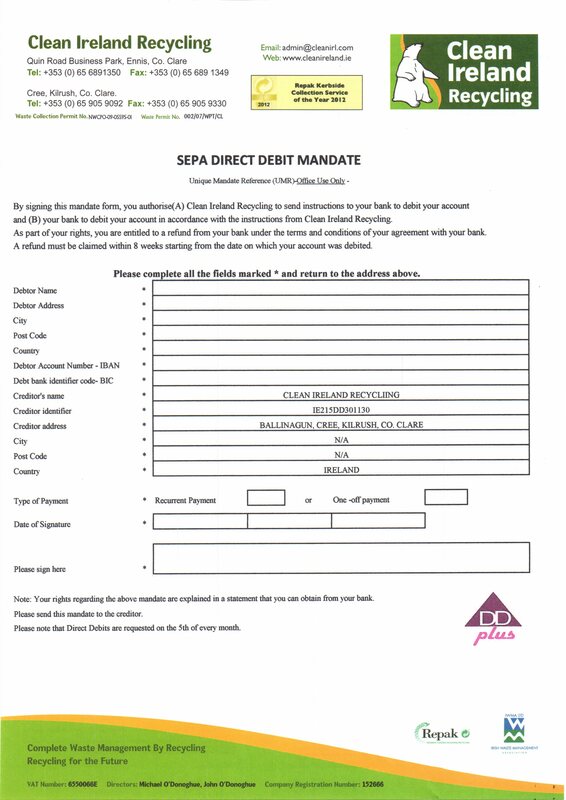 If part-paying your invoice, please ensure your account is paid up to date to avoid disruption to your collection service. Please ensure you allow 3–5 working days for payment to be credited to your account. Our trucks are automated; accounts not in service cannot be emptied by the truck. To check account balance and expiry date, ring 1890 361800 select option 2, option 1. *€20 Minimum payment amount at Post Office.